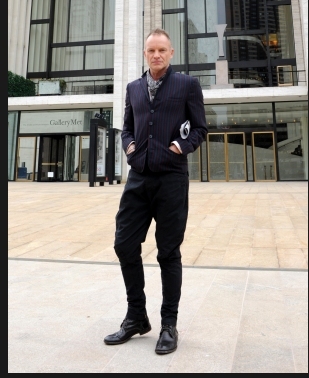 The Metropolitan Opera in association with Live Nation announced today that Sting, accompanied by the Royal Philharmonic Concert Orchestra, will make his debut at the Metropolitan Opera in New York City on July 13 & 14, 2010, at 8pm. Sting's engagement at this legendary opera house is part of his world tour, during which he will perform his most celebrated songs re-imagined for symphonic arrangement. The Royal Philharmonic Concert Orchestra will be conducted by Maestro Steven Mercurio (Pavarotti, Bocelli). "The Metropolitan Opera has such a rich cultural history in supporting and celebrating a truly diverse range of artists. It is both an honor and a thrill to have the opportunity to perform at this renowned landmark," commented Sting. Sting's diverse and illustrious career has produced numerous multi-platinum albums, a staggering list of number one songs, countless accolades, and worldwide record sales of nearly 100 million. On the upcoming world tour, Sting's greatest hits will be re-interpreted with brand new orchestrations created especially for this tour. Selections will include fan-favorites such as "Roxanne," "Next To You," "Every Little Thing She Does Is Magic," and "Every Breath You Take," to notable songs from Sting's enduring solo career - "Englishman in New York," "Fragile," "Russians," "If I Ever Lose My Faith in You," "Fields of Gold," and "Desert Rose." Performed in a variety of settings, the tour begins on June 2 with a sold out show in Vancouver at the Centre for Performing Arts, followed by already sold-out shows at such notable venues as Denver's Red Rocks Amphitheatre, the Hollywood Bowl in Los Angeles, and Chastain Park in Atlanta. Sting will also make a two-night stop at the renowned Ravinia Festival in Chicago before the tour concludes on July 31 at the Saratoga Performing Arts Centre. Following the North American dates, An Evening with Sting featuring the Royal Philharmonic Concert Orchestra will perform throughout Europe and the UK, with dates, cities and venues to be announced soon. Sting's interest in collaborating with an orchestra began in 2008, when he was invited to perform with the legendary Chicago Symphony Orchestra. After reworking selections from his expansive catalog, Sting and several members of his longtime band joined the orchestra in a performance that left an indelible mark on him. Eager to explore the possibilities of further symphonic collaboration, Sting was excited when the Philadelphia Orchestra asked him to join them in commemoration of the 153rd anniversary of the Academy of Music. "Performing with both the Chicago Symphony Orchestra and Philadelphia Orchestra was truly a highlight of my career. I'm delighted by this new opportunity to tour with the Royal Philharmonic Concert Orchestra and reinterpret the songs I've been playing for many years," added Sting. Xerox is the tour sponsor. Starwood Hotels and Resorts is the official hotel partner. "As one of the most celebrated artists of our time, we're thrilled to be the Official Hotel sponsor of the 2010 Sting tour. This sponsorship provides a distinctive opportunity for us to reward our loyal members by connecting with them through their passion for music," said Phil McAveety, Chief Brand Officer for Starwood. For complete Tour and Ticket information, Fan Club Memberships, Merchandise and more, visit: www.sting.com & www.livenation.com. American Express® Cardmembers have the exclusive opportunity to purchase advance tickets for the two STING performances at The Metropolitan Opera from Monday, April 12 at 10am through Wednesday, April 14 at 10pm. Preferred Seating available to Gold Card, Platinum Card and Centurion members. For tickets, call 1-800-745-3000 or visit ticketmaster.com. The public on sale for these concerts will take place on Friday, April 16th at 10:00 am. Tickets can be purchased at ticketmaster.com and charge by phone 800-745-3000. Under the leadership of General Manager Peter Gelb and Music Director James Levine, the Met is committed to revitalizing the company's repertory and broadening its audience. The Met's 2010-11 season will feature seven new productions, including the first two installments of a new Ring cycle, directed by Robert Lepage and conducted by Maestro Levine, and two company premieres (John Adams's Nixon in China directed by Peter Sellars, and Le Comte Ory directed by Bartlett Sher). The season, featuring the world's greatest singers, also includes new productions of three repertory classics by debuting directors - Boris Godunov by Peter Stein, Don Carlo by Nicholas Hytner, and La Traviata by Willy Decker. The Met: Live in HD, the Emmy and Peabody Award-winning series of live performance transmissions to more than 1,000 movie theaters around the world, returns for its fifth season in 2010-11. The series of 11 transmissions begins October 9 with Das Rheingold and ends with Die Walküre on May 14. Other ways to access the Met's vast catalogue of performances include the online streaming service Met Player; Metropolitan Opera Radio on SIRIUS XM Radio; the Toll Brothers-Metropolitan Opera International Radio Network; and the Met on Rhapsody. The Met also presents free live audio streaming during the opera season on its website with support from RealNetworks®. Additional audience development initiatives include free Open House dress rehearsals, a popular rush ticket program, and reduced ticket prices. For more information, please visit: www.metopera.org. Xerox Corporation is a $22 billion leading global enterprise for business process and document management. Through its broad portfolio of technology, services and outsourcing offerings, Xerox provides the essential back-office support that clears the way for clients to focus on what they do best: their real business. Headquartered in Norwalk, Conn., Xerox provides leading-edge document technology, services, software and supplies for production and office environments of any size. Through ACS, A Xerox Company, which Xerox acquired in February 2010, Xerox also offers extensive business process outsourcing and information technology outsourcing services, including data processing, HR benefits management, finance support, and customer relationship management services for commercial and government organizations worldwide. The 130,000 people of Xerox serve clients in more than 160 countries. For more information, visit http://www.xerox.com or http://www.xerox.com/news. For investor information, visit http://www.xerox.com/investor. The SPG program's breakthrough policy of No Blackout Dates at the world's most sought after collection of hotels, reinvented the hospitality loyalty program when it launched in 1999. By creating a program centered on its members, SPG has developed the most passionate and knowledgeable membership base in the hotel loyalty space. Through its use of new technologies and innovative channels such as SPG.com, SPG.com/stayconnected, SPG.com/flights, thelobby.com and others, SPG continues to innovate and lead the industry. By offering No Blackouts on standard rooms at 940 participating properties, No Blackouts on hundreds of airlines, and once in a lifetime experiences available through SPG Moments at spg.com/moments, the program has proven to be a big draw for the world's most frequent travelers. It is also a significant competitive advantage for Starwood and its nine distinct and compelling brands: St. Regis®, The Luxury Collection®, W®, Westin®, Le Méridien®, Sheraton®, Four Points® by Sheraton, and the recently launched Aloft®, and Element SM. With the world's largest portfolio of upper-upscale and luxury hotels, SPG members enjoy unrivaled access to distinctive, aspirational experiences located in premiere destinations in nearly 100 countries. For more information about Starwood Preferred Guest please visit SPG.com or call (877) - STARWOOD.